SCAMMERS TRICKING THE HUNGRY "FREE BOX OF DUNKIN' DONUTS"
The Dunkin’ Donuts name also being used as a phishing scam. Remember, if you realize nothing’s for free in this world, then you can never get scammed. 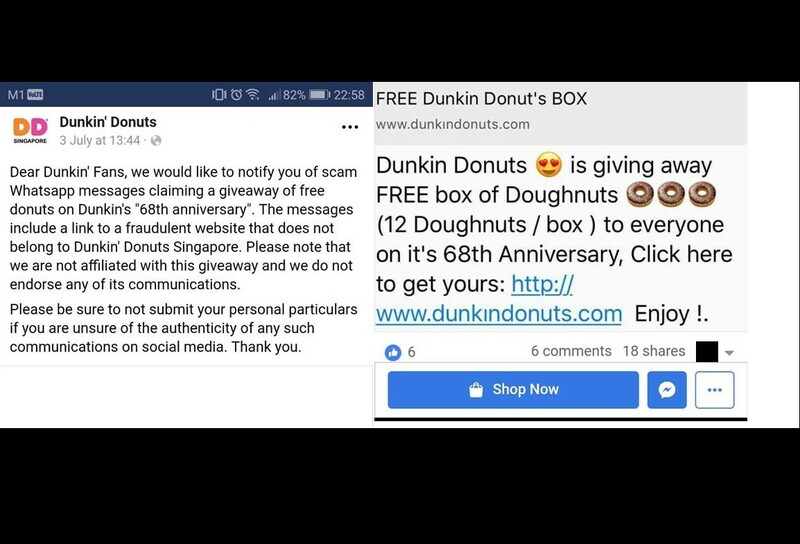 Dear Dunkin’ Fans, we would like to notify you of scam Whatsapp messages claiming a giveaway of free donuts on Dunkin’s “68th anniversary”. The messages include a link to a fraudulent website that does not belong to Dunkin’ Donuts Singapore. Please note that we are not affiliated with this giveaway and we do not endorse any of its communications. Please be sure to not submit your personal particulars if you are unsure of the authenticity of any such communications on social media. Thank you. Learn more about phishing at the below link. Previous ArticleHIT & RUN AT WOODLAND CHECKPOINT!!! NEED THE POWER OF SOCIAL MEDIA! !